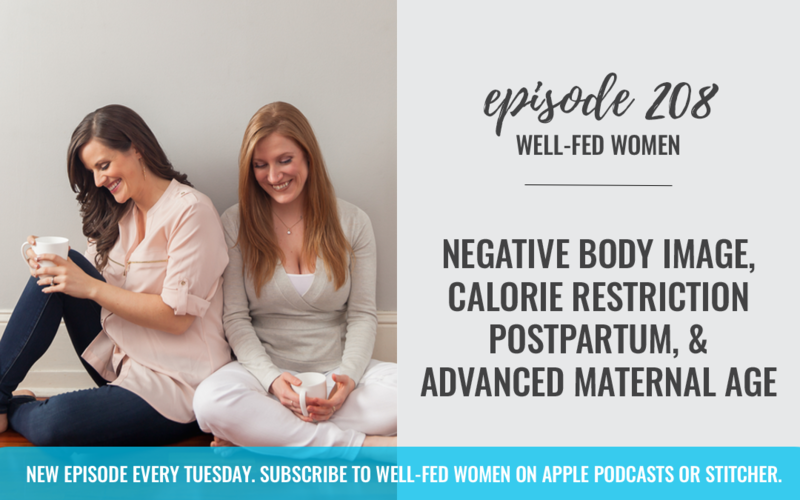 This week, Noelle and I discuss negative body image, calorie restriction postpartum, &amp; advanced maternal age. This podcast is supported by Fabletics, a fashion focused activewear brand with a mission to empower women by making a healthy, active lifestyle accessible to everyone because of its exceptional price point. Fabletics was born in 2013 and co-founded by actress Kate Hudson. The founding team noticed a large disparity in the activewear market place—comfortable, on-trend gym wear that was priced affordably. Since then, Fabletics has been a one stop shop online for women pursuing all kinds of activities, yoga, running, gym workouts, and they have sports bras, shoes, and accessories. Fabletics is offering our listeners an incredible deal: Get 2 leggings for only $24 ($99 value) when you sign up for a VIP. Just go to fabletics.com/wellfedwomen to take advantage of this deal now. You will also get Free Shipping! Fabletics also releases brand new styles, collections and prints every month! If you guys become a VIP with Fabletics, you’ll get up to 50% off regular pricing and instant access to their latest collections.